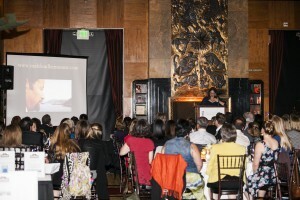 On April 12, 2016, a sold-out crowd of over 130 lawyers, law professors, law students, international women’s rights activists, and their supporters gathered at the City Club in San Francisco for a gala dinner to celebrate IANGEL’s third anniversary. 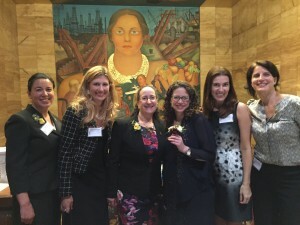 Aptly titled, “Acts of Courage, Seeds of Hope,” the gala dinner featured and honored the remarkable human rights lawyer, professor, author, and activist, Karima Bennoune. Ms. Bennoune is the United Nations Special Rapporteur in the Field of Cultural Rights, a professor at UC Davis School of Law, and the author of the award-winning book “Your Fatwa Does Not Apply Here – Untold Stories of the Fight Against Muslim Fundamentalism.” This critically acclaimed book highlights the power of peaceful civil society resistance against violent forces of fundamentalism and repression. The event started with a lively reception and silent auction, and featured live music by the east bay trio Muse Crossing. 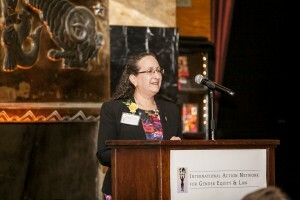 In opening comments, IANGEL’s founder and president, Nancy Newman, reflected on how far IANGEL had come in just three years – from the organizational challenges of creating a new nonprofit – to multiple successful collaborations on international women’s rights projects and presenting IANGEL’s paper promoting pro bono engagement at the 2016 United Nations conference on the status of women in New York City. Nancy noted the high stakes involved in the struggle for gender equality globally, providing a poignant reminder that each of us bears responsibility to be involved. IANGEL’s Executive Director, Cecilia Lipp, added eloquent comments about amazing lawyers and activists with whom IANGEL has been fortunate to partner, and the importance of building our connections, as we develop a new model for increasing pro bono engagement in the cause of women’s rights globally. The highlight of the evening was the presentation of IANGEL’s 2016 Rights and Leadership Award to Karima Bennoune, and her keynote address. Ms. Bennoune embodies the principles of IANGEL and our goal for a more just and secure world. She has spent her career advocating and supporting democracy, rights, and equality, and has helped numerous non-governmental organizations to protect human rights and justice with an unwavering personal commitment. Like her Ted Talk, which has over 1.35 million views, Ms. Bennoune’s informative and inspirational keynote address provided keen insights about this struggle, through moving stories and photos of the brave activists in the Muslim world working for equality, justice, and peace, in the face of violent extremism and terror. Some of those she had interviewed in her book had since been murdered for their courage, but their work continues, across the world. Reflecting on their sacrifice, Ms. Bennoune inspired all who attended to recommit to the global struggle for human rights and gender equality. 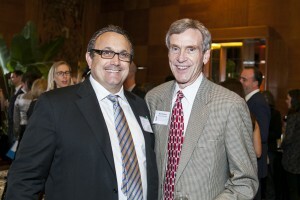 The event also featured inspiring comments by Hanson Bridgett’s managing partner, Andrew Giacomini, providing his personal perspective, as both a law firm managing partner and the father of daughter, on the critical importance of pro bono work for equality and justice. The evening closed appropriately with Muse Crossing’s beautiful rendition of Ingrid Michaelson’s “When I Go.” IANGEL was proud to have the opportunity to honor Karima Bennoune for her incredible work for equality, human rights, and peace. IANGEL is deeply grateful to Gold Sponsor Hanson Bridgett, Silver Sponsors Keker & Van Nest and Sack Properties, our outstanding host committee, community supporters, silent auction donors and bidders, Muse Crossing, Kelley Vorves Photography and all attendees for making the event an inspiring celebration of courage and hope for rights and equality around the world. We look forward to sharing our plans for IANGEL’s 4th anniversary celebration next spring!